With approximately 400 start-ups already functioning in the city, Lucknowites are no strangers to innovation. A thriving start-up ecosystem, coupled with the renewed interest of entrepreneurs has ushered in a new IT wave of sorts in Lucknow. A growing presence of infrastructural and management support and efforts to bring together the IT community, keeps them well-informed about the latest developments in the industry. 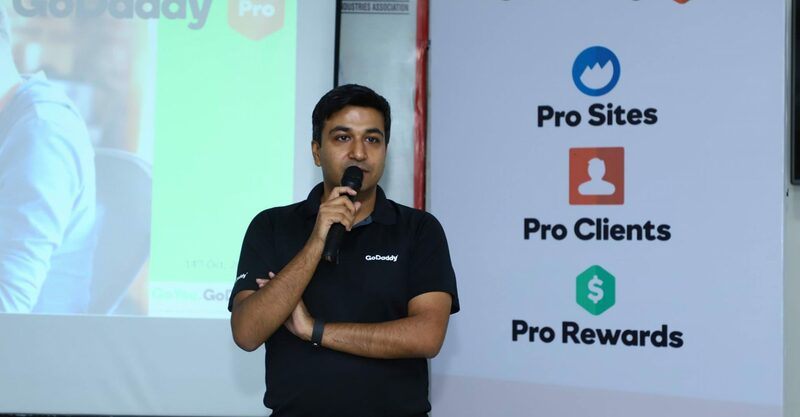 GoDaddy, an internet domain registrar and web hosting company recently held their first ever ‘GoDaddy Web Pro Meet’ in Lucknow. The event brought together industry experts and professionals. More than 700+ customer care professionals handle over 4,000 calls per day, making GoDaddy the world’s largest cloud platform to empower independent businesses. It enables them to build professional websites and helps them grow. The meet was well attended by 100+ web developers, freelancers, digital marketers, Ui/UX developers, content writers, and tech entrepreneurs. It was intended to educate the web developer community about the GoDaddy Pro benefits and how it can help boost web development business operations. The session was started by Mr. Gaurav Nakul, who is India Head for GoDaddy Pro. He took the participants through an hour-long exhaustive presentation about GoDaddy Pro products, how to make the most of them, and the benefits that could be derived as a result. Later, he introduced a GoDaddy pro customer, Mr. Qais Mujeeb, Founder and MD, Ascezen Consulting Pvt. Ltd. (an established name in end-to-end web & content consulting services) who shared his story of setting up his web development business in Lucknow while using GoDaddy products. The event was followed by a networknig session over high tea, where Lucknow’s web developer community interacted and connected with each other. GoDaddy Pro is GoDaddy’s latest program that is tailored specifically for the needs of the web professionals and their clients. It offers enhanced features such as easy management of multiple GoDaddy customer accounts and websites from a single dashboard, reward points on new purchases and the ability to list your profile on Pro connect directory where SMB’s can find web professionals. GoDaddy ventured into the international market with India and hosts the largest International customer base which recently surpassed the one million mark. It also boasts of being the market leader with the maximum share in .IN domains. Nice to have these types of occasions as it brings awareness among the people and they interact with each other. And it will solve their issues and clear their doubts with each other. GoDaddy, an internet domain registrar and web hosting company recently held their first ever ‘GoDaddy Web Pro Meet’ in Lucknow. The event brought together industry experts and professionals. this a very good event. The Go Daddy event in Lucknow was a happy news for us Lucknowites. Lucknow, being the capital of the largest state population-wise, owes many more such events to evolve an environment conducive to its industrial and commercial growth. Lucknow is loved and known for many things but industry and commerce. It craves for concerted efforts from the Government to help it find its reckoning among the big cities of India. The city must be developed to realize its full potential. If done so, it would prove to be a growth engine for its satellite cities and towns. It would attract industries and brands which have not visited the city yet. Those, which have come to the city, but operate on a small scale, would scale up their operations. A synergy would be set up to benefit not only Lucknow and its people but also areas around it and its inhabitants. We hope our wait for such an environment would not last long.